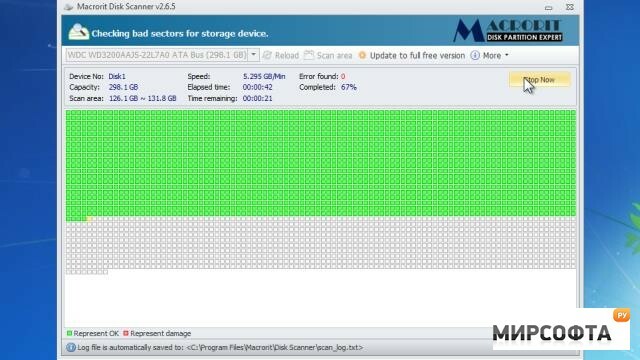 Macrorit Disk Scanner is a smart bad sector scanning software that can help you quickly test the disk and mark the location of bad sectors. Hard disk "bad sectors" is the most common problems of the hard disk. Bad sectors are little clusters of data on your hard disk that cannot be read. Hard disks with bad sectors means the disk is not safe to store data; it will eventually lead to the important data loss of the hard disk or partition as well as errors with running files and the hard disk speed will slow down significantly and blue screen errors may also occurs. Support automatic shutdown after the scan is completed, and automatically save the scan results in the specified location. Select the fastest "smart" algorithm, the scanning speed should reach the maximum supported by the device.